I seem to keep coming back in this series to WESTERN STORY and H.W. Scott. I suppose that's because the magazine was one of the leaders in the Western pulp field for so long and because Scott painted so many covers for it, and painted them so well, to boot. This one has a circus theme, and Westerns and circuses seem to go together well. I've written a few myself using a traveling circus as a major plot element. I don't know if this cover is meant to tie in with any particular story in the issue. It seems unlikely, based on their titles. But I'm sure they're fine stories, anyway, considering that they were written by Walt Coburn, Peter Dawson, Hugh B. Cave, and Philip Ketchum, all excellent Western pulp authors. You are right, I checked my copy and there is no circus story. 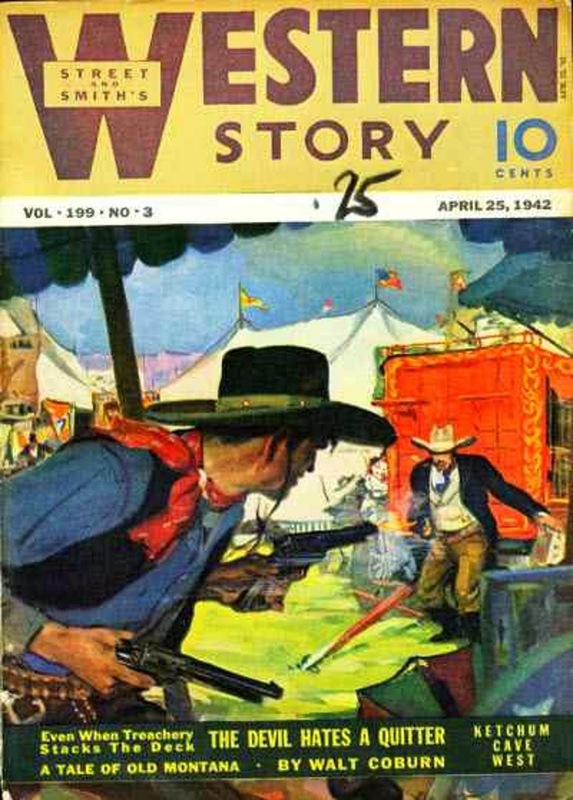 1942 was the last strong weekly year that WESTERN STORY had. The very next year in 1943 they were forced to change to a bi-weekly schedule and the smaller digest format. This was because of the paper restrictions in WW II. They never recovered. The magazine limped along to 1949 before expiring because of the decision by Street & Smith to concentrate on slick women's magazines. They killed their entire pulp line of magazines except for ASTOUNDING.